All of these photos were taken on Prince Edward Island, Canada. This entry was posted in Abandoned Buildings, images of kitchens, Nostalgia, Uncategorized and tagged abandoned buildings, images of kitchens, kitchens, Nostalgia, old time kitchens, Wordpress Weekly Photo Challenge on October 1, 2016 by lifelessons. 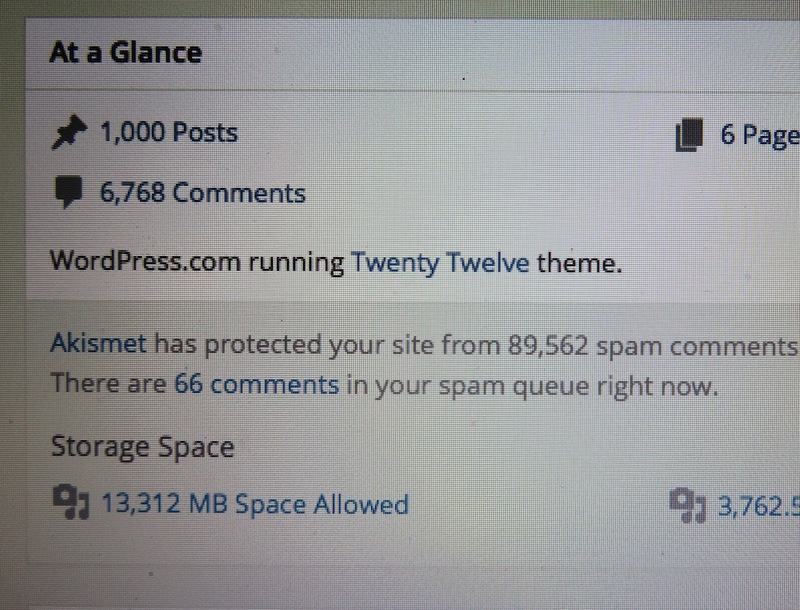 My 1000th Blog Post !!!! When I made my first blog entry on NaPoWriMo, taking the big step to commit to one posting a poem a day for 30 days, it seemed like a task I might not be able to complete. I made the pledge to myself nonetheless, perhaps knowing my own nature and my dislike of not fulfilling obligations. I made it, sometimes in the nick of time. I think one posting was made at 65 seconds before midnight, thanks to a power outage and earlier obligations which kept me from posting first thing in the morning, as I usually did. My days during that first month of daily postings went pretty much as they go now: 8:30, let the dogs out and see if the prompt was posted yet. 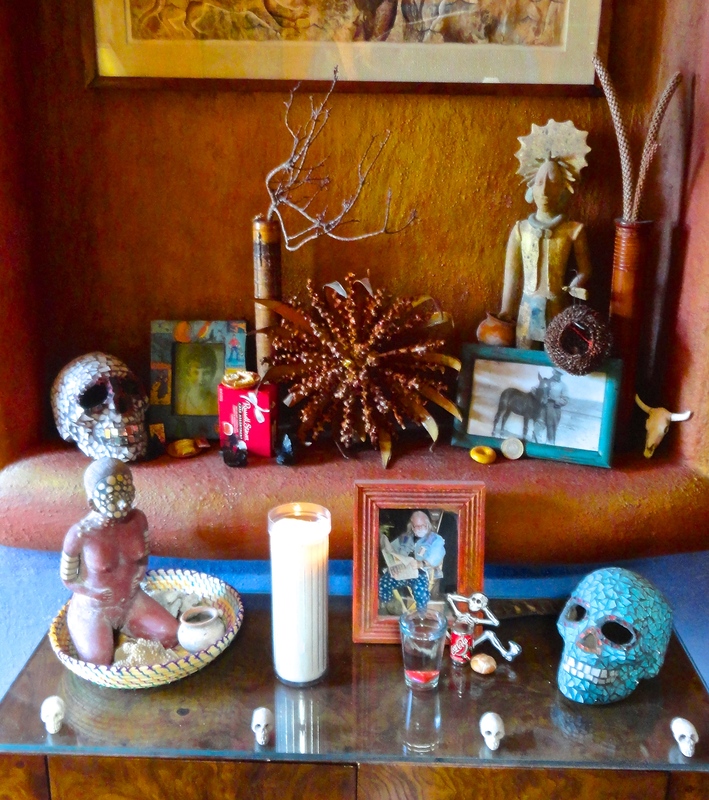 9:30–last possible moment to feed the dogs without Frida going into an apoplexy of barks. By noon, my poem was usually written and posted, but sometimes the internet went out. Sometimes workmen came. Sometimes the electricity went off. Other than these mitigating circumstances outside of myself, posting was always first priority. This was my first ever picture posted on my blog, on September 12, 2012. 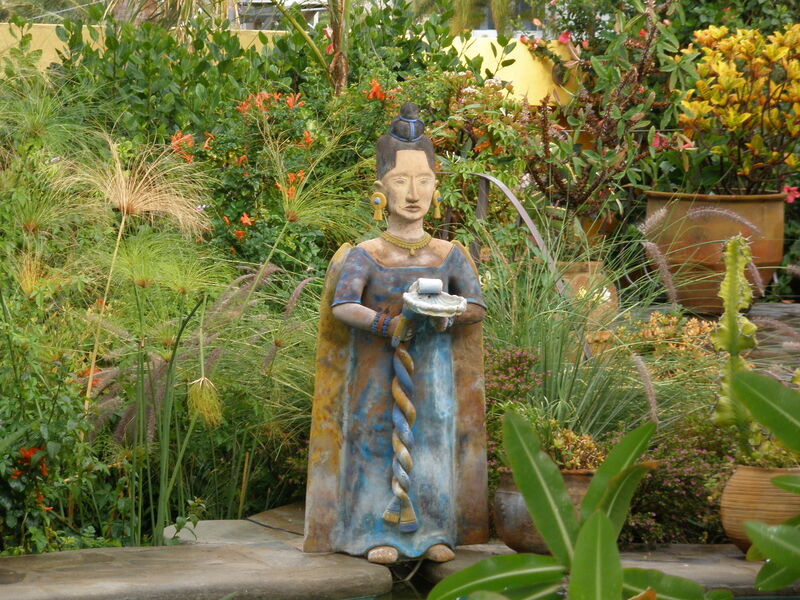 This fountain of a Mayan woman is long deceased, having been knocked into the pool by a visiting workman, repaired and repainted, then again knocked in by either my gardener or dog–a different report according to who was speaking. This time, she was unrepairable, so parts of her reside separately in different parts of my garden. I didn’t post any more pictures until March, 2013. This is one of the pictures I posted then that I used for the cover of my book, Lessons from A Grief Diary–which was initially my purpose in starting a blog, but after my initial posts and a few replies by readers and friends, my posts were few and far between until April, when I participated in my first NaPoWriMo. After that month of posting a poem a day, I made almost no posts again until April of 2014 when I again participated in NaPoWriMo. It was at the end of that 30 day period that I decided to just keep going by doing the WordPress daily prompt, initially posting every day, then gradually adding photo prompts and occasional challenge prompts from viewers, up until the present day, when my record total number of posts per day reached 9 one day this past week. I had no idea I had made that many until I read it on my stats page. I was sure they were wrong, but they weren’t. So it is official. I am obsessed by blogging. Not only writing them but reading them and conversing with other bloggers. I love that I am in daily communication with interesting bloggers from India, Nigeria, Australia, the States, Canada and other points all over the world. Iceland. Greenland, Mongolia, Kenya and Indonesia. Too many more to name. I know what is going on with women’s rights in India and Journalist’s rights in Saudi Arabia. I know that this week a Nigerian king cannot be buried because the man who has been raised from birth to accompany him to the grave (and by this euphemism, I mean to be buried alive with him, as in the style of Egyptian pharaohs) has run away! I know that a good blogging friend’s beloved dog has passed away but I also know intimate details of the most important dolls in her life. I know that my friend Judy King, who lives here in Mexico, had a Tiny Tears doll, as did I and I know the worries of a sixteen year old girl, a friend again looking for employment, the sadness of a twinless twin. I have met nomads, travelers, photographers, introverts, shut-ins, journalists, and those fighting bravely for the security and safety of their transgendered friends. It is incredible how the world has opened up for me in the nearly two years I have been seriously blogging. A friend told me very early in my blogging life that she didn’t get it. To her it just looked like an exercise in ego to be posting a blog each day. I don’t think she’s ever looked at my blog. Nor has another close friend who likes all of my books but who says she “Doesn’t do blogs!” Other friends read and comment, knowing that even though a message isn’t sent exclusively for them and to them that it can still be personal and interesting and true. In blogging we expand our circle–like a group telephone conversation on Skype or a support group or interest group. Blogging is the corner bar minus the drinks, the pot party where no one inhales, the slumber party not limited exclusively to girls. Very rapidly, it has become one of the most important parts of my life. What I wake up for. Where I go when I need advice or I’m feeling blue. Some blogging friends have moved through my life and disappeared. Most of them are mothers with a lot else to do, so I understand. But others have come to take their place and I am constantly surprised by what it is that they respond to. A recent posting with pictures of my favorite dolls of the past, posted exclusively for a friend who collects dolls, drew interest from men and from Judy King, whom I mentioned earlier–a journalist friend who wrote pages in my comments section–a wonderful story of her favorite doll that I hope she develops into a story some day. Every day when I force myself to leave my house and go back out into the physical world, I meet people who, when they hear my name, say, “Oh yes. I read your blog!” People I did not know in my own small community as well as surrounding towns have become supporters, occasionally noting on Facebook or in my comments section that they are daily readers of my blog. 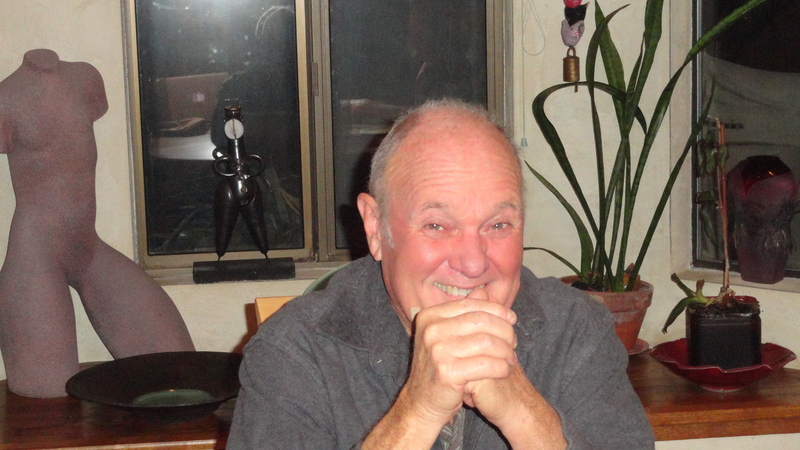 I’ve heard from kids I went to high school with, college friends I haven’t seen in 50 years–even one old boyfriend of my sister’s (when she was 12) whom I had never even met when we both lived back in South Dakota. I have reconnected with my favorite cousin’s wife and daughter, my high school principal’s ex-wife, who it seems was a friend of my older sisters in high school and who was there when those pictures of me and my friends in Johannsen’s dam were taken. She and my sister were the ones who had driven us to the dam to swim! And, in a remarkable coincidence, I’ve heard from Douglas Johannsen, whose uncle owned the dam! Long story short, I’m not accepting the charge that I am writing a blog purely out of ego. Yes, in writing it I am recording a life, but I am also making one. And what a big big life it has turned out to be! Thanks to all my funny, smart, loyal, dedicated, varied, weird, uncategorizable blogging friends. 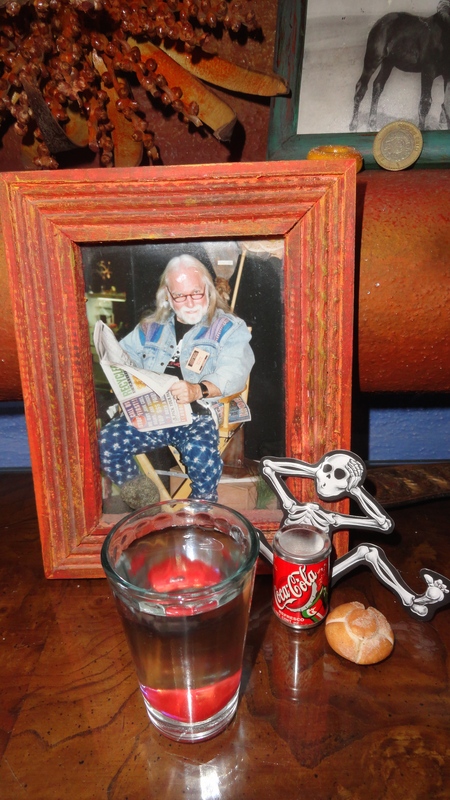 I wish I could send you all a piece of cake or glass to lift. Instead, I send you a slice of my life because you have sent to me so many slices of yours, and they were delicious!!! And so, on to the next 1000!!!! 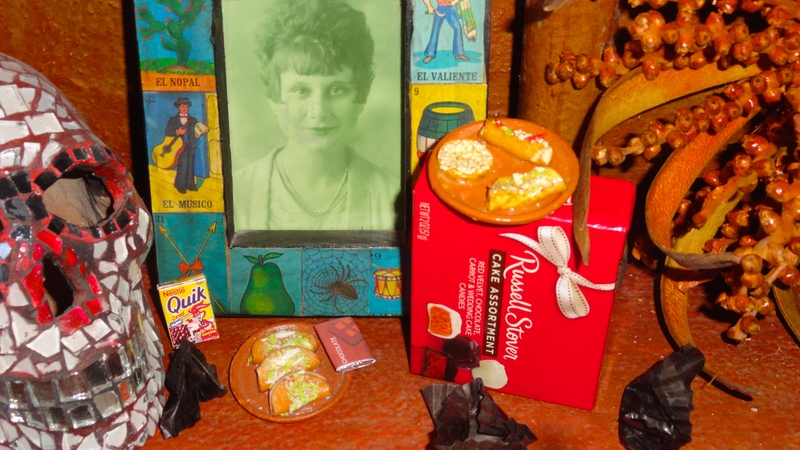 This entry was posted in Blogging, Essays, Nostalgia and tagged Blogging, Blogs, Daily Life, Daily Post, Daily Prompt, judy dykstra-brown essay, Nostalgia on August 16, 2015 by lifelessons. Update Dec. 14, 2017: I’m very curious about why, three years after I posted this story about Agustin on my blog, I’ve suddenly had over 200 viewings of it in one day. If you’re reading this, would you please add a comment to tell me how you came to do so? Thanks, and thanks for viewing it! The Prompt: Second-Hand Stories—What’s the best story someone else has recently told you (in person, preferably)? Share it with us, and feel free to embellish — that’s how good stories become great, after all. I have been told many stories by Agustin, and some day I will share them with you, but I think they’ll have more power if you know more about the man, so today I want to tell you about him. Taking a break from all your worries, sure would help a lot. . . . 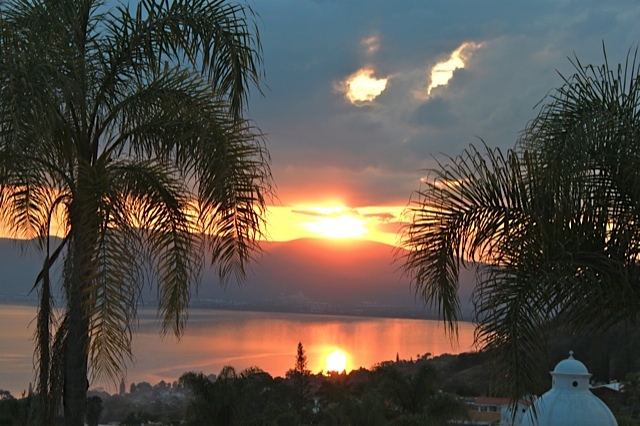 In San Juan Cosalá, Mexico, a pueblo of 6,000 on Lake Chapala, about an hour’s drive away from Guadalajara, that place is Agustin Vazquez’s restaurant, Viva Mexico. It is a warm, art-filled social center for the community that in my opinion also happens to serve the best food lakeside. 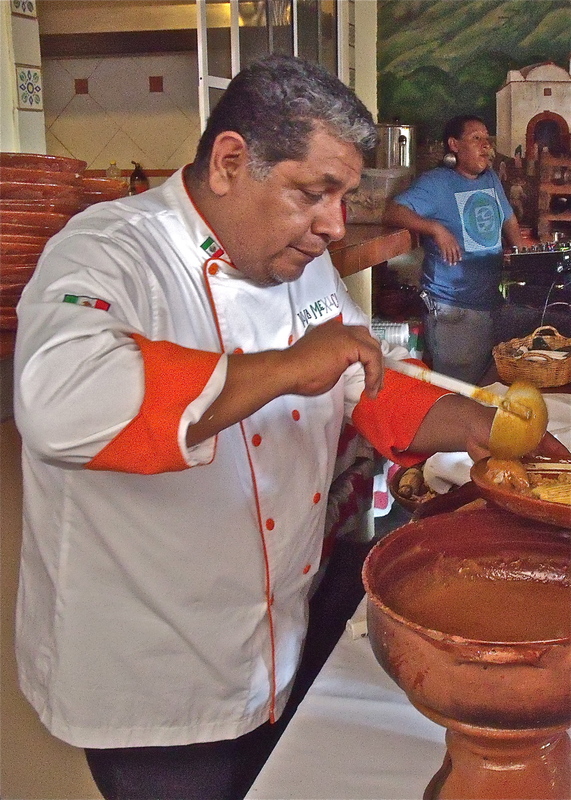 Here as in the rest of his life, Agustin functions as half scholar, half artist, surveying other restaurants, cookbooks, websites and even literature such as Like Water for Chocolate for recipes that will enable him to bring to life again Mexico’s rich culinary history. Quail in rose petal sauce is one such recipe which joins other special menu offerings such as fish fillets cooked in banana leaves with fresh herbs, chiles en nogada, pork shank, and ribs simmered in Agustin’s homemade sauce. Other traditional favorites are pozole (a rich pork and hominy stew) and molcajetes (beef, chicken or shrimp with sweet green peppers, onions, panela and other cheeses with a red or green sauce, cooked in a traditional stone receptacle). My favorite is a molcajete of chicken breast cooked in green sauce. Mmmmmmm. No one I’ve ever recommended it to has been disappointed, and I recommend it to everyone I see who is about to order. More artistry is displayed in the presentation. Vegetables are fanned in flower shapes, organic lettuce supports the freshest tomato slices, and the entire plate becomes an artistic pleasure that makes one pause a moment to survey the plate before succumbing to the wonderful odors that presage delightful tastes and textures to be experienced. 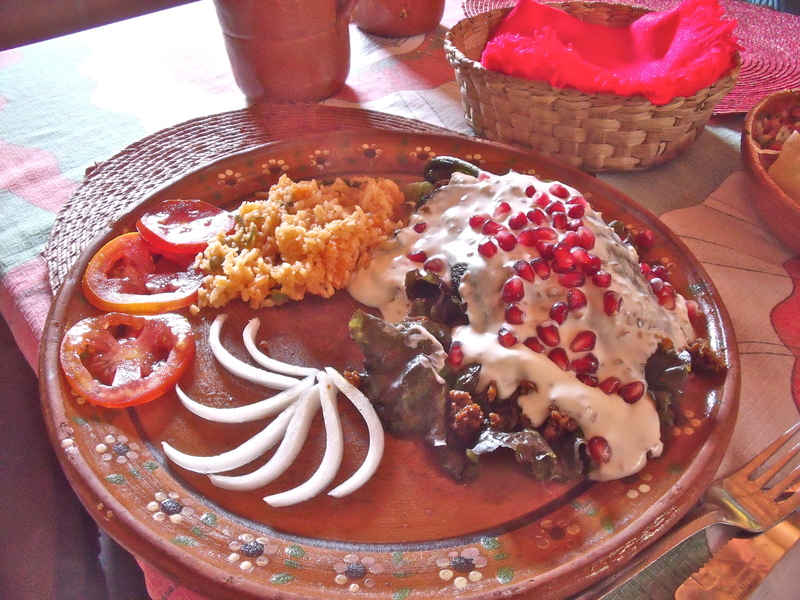 Chiles en Nogada is a popular item on the menu. A lifelong local resident who has his community and its people in his heart, Agustin is so busy that it is hard to imagine how he fits all of his obligations into one day, for his creation of one of the most popular restaurants in the area is just one small part of his life. He also helps to direct a charitable food operation that now feeds 100 families in his home village, personally purchasing the food and for years, delivering it to each family once a week. (Now the families come to receive their weekly ration from a new region of his restaurant that serves as a storage space and dispensa for Operation Feed.) Since he joined the program a few years ago, his skill in bargaining has allowed them to double the number of families who are helped by the program. He does not allow them to reimburse him for his gas or his time. With his knowledge of the village, Agustin has cut the time for weekly food deliveries in half in the year since he has been doing the driving. I first met Agustin in 2002 when I became involved with a group of local Mexican artists. Agustin, who at the time was working as a real estate agent and contractor, had long been their patrón (sponsor) and so when I approached them about helping to stage a children’s art experience where they would paint pictures on the theme of cleaning up the lakeside and their village, Agustin immediately became a major supporter of the project, helping to buy backpacks and school supplies for the prizes. 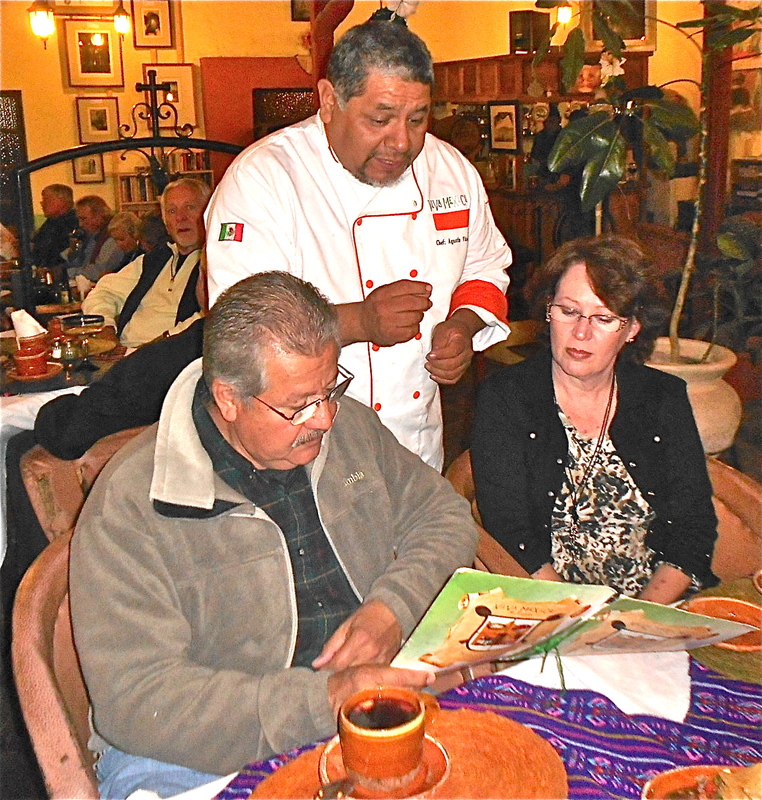 When we staged a fundraising concert to send a young opera singer to the U.S., Agustin fed us all afterwards in what was then his Aunt Lupita’s pozole restaurant. At the time, it was dirt-floored, the simple kitchen was open to the air and parts of the restaurant were without a ceiling. 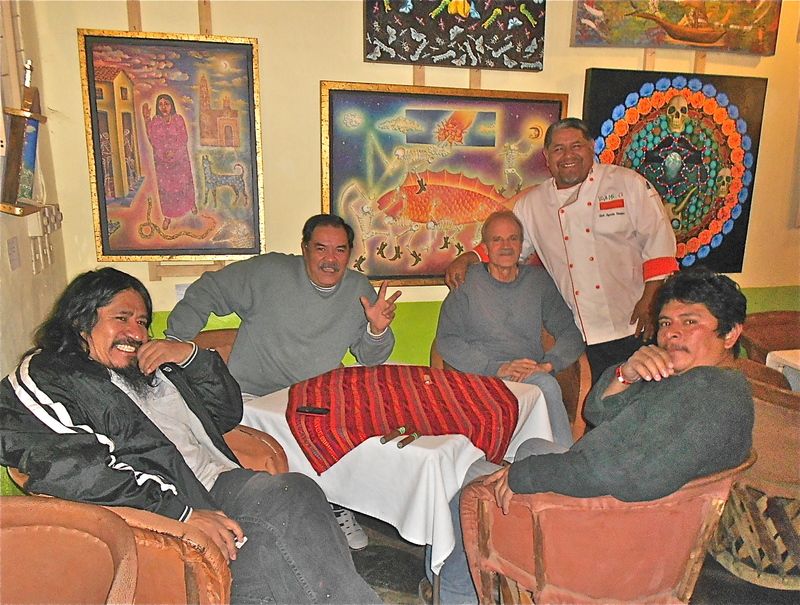 Agustin greets Isidro Xilonzochitl and other artists and friends who are regulars at Viva Mexico. That statement forms the crux of the magic of a place like Agustin’s. It really is the place that binds us all—Mexican and expats—together. This first started to happen on September 12 of 2007, when weeks of rain were followed by a tromba (waterspout) that dumped water into the hills above the Raquet Club and the town, causing a tremendous downrush of water that brought boulders, dirt and everything in its path down the mountainside and into the town. Walls, buildings and roads gave way to the avalanche of water and rock, leaving much of the town devastated. Agustin, who had recently purchased his aunt’s restaurant, stepped immediately into the fray, feeding the thousand or so displaced residents and relief workers three meals a day. Originally paying for the food out of his own pocket, he was eventually given food and aid by other residents, both Anglo and Mexican; and this is how the Mexican and Anglo communities were given a chance to mingle and get to know each other on a more intimate level. When I volunteered, Agustin first gave me a broom to sweep the dirt floor. By the end of the week, I was stirring huge pots of beef and waiting on tables as his restaurant filled three times a day. The work was exhausting as Agustin and eventually, 25 volunteers, most of them family members, worked to provide three meals a day. By the end of ten days, this amounted to over 3,000 meals! By the time he had persuaded local politicians to take over this task, in addition to losing out on almost two weeks of income, Agustin was so in debt for supplies he had bought out of his own pocket that for two months, he questioned his ability to reopen the restaurant. Most of his knives, forks and salt and pepper shakers had been thoughtlessly carried away with carry-out meals. Teary-eyed, Agustin told me about local neighbors, poor themselves, who heard of his plight and offered him hands full of change to try to help, but in the end, he was still $75,000 pesos in debt. With three sons and a wife to support, Agustin could not afford to take more of a break than was absolutely necessary, so mustering his courage, he somehow found the means to again open the restaurant which four years later has become the heart of the community. What factors go together to create these great qualities of entrepreneurism, courage, generosity and artistic sensibility in a man? Knowing a bit more about Agustin’s history might give us a clue. When he was born in San Juan Cosalá in 1966, the midwife told Agustin’s mother that this child was different and special, that he would bring luck to his family and all around him. When I asked Agustin what quality the midwife had noticed, he did not know, but later when we talked again, I asked him if he had been born with a caul over his head, as this is the traditional sign world-wide that a child is destined to greater things. When I described what this meant, Agustin nodded his head in agreement. This is how the midwife had described it, but he had never known the term for it. “I was a troublemaker in secondaria,” Agustin confessed to me, “because I always questioned the priest, wanting to know more.” Agustin credits Padre Adalberto Macias with changing the town through education. “He didn’t want me there, though, because all those questions were a disruption,” admits Agustin. Ironically, Agustin is now the man who drives to the Abastos (wholesale market) in Guadalajara each month to procure food and deliver it to Casa de Ninos y Jovenes, the residential school for disadvantaged youth run by Padre Adalberto. In July of 1978, at the age of twelve, Agustin went north to the U.S. for the first time. His father put him in school in Lompoc, California for three or four months, but as one of only four Mexicans in the school, he was not treated well and he begged to be sent back to Mexico. Sadly, although he did manage to complete secondaria (tenth grade), there was no money to send him to preparatorio. Instead, at the age of 14, he quit school to blast rock at the Piedra Barrenada, the stone cliff north of the fish restaurants on the carretera (highway) east of San Juan Cosalá. “On Saturday and Sunday, I worked as a waiter,” Agustin told me. When Agustin accepted his first job as a waiter, did he ever dream that one day he would be serving customers in his own restaurant, wearing a designer chef’s coat that was the gift of a customer? It was his mother who had intended to go north to find his father, whom they had not seen for three years. 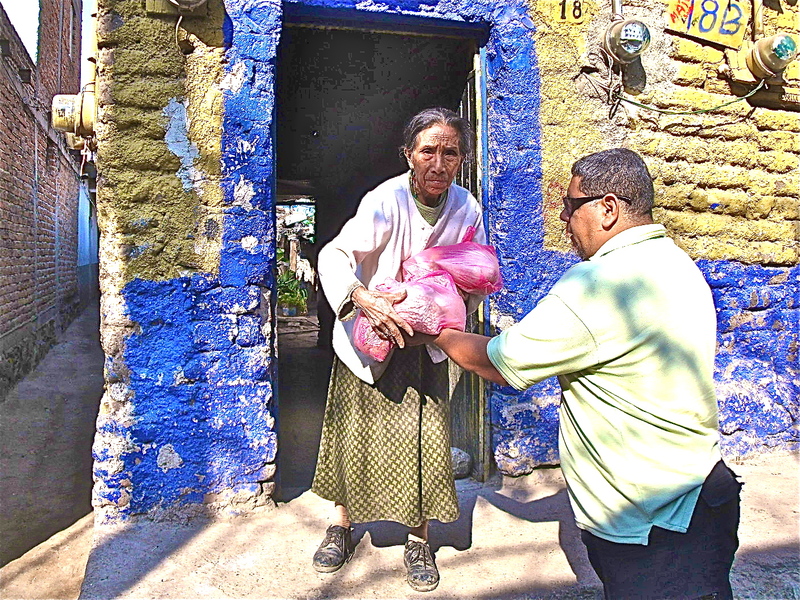 She had heard rumors that he was very ill and living in Tijuana, but how could she leave with so many children to cook for, she asked, and begged him to go in her place. He lived for one month in the streets of Tijuana, looking for his father. When he found him, his father was in a hospital, having just undergone surgery. Once he recovered, they had no money to return home, so they went to the U.S. where this time, Agustin worked in the fields with his father for one year. “Cities on the borderline are horrible,” he told me. “They are so sad. Many people from different countries with no money to leave. So sad.” After one year of working in the states, he came back to Mexico to work in construction. In 1990, Agustin married Antonia, a local beauty queen. “I saw her at a dance,” he said, and chuckled guiltily as he added, “She was with my friend, but when I saw her, I just had to ask her to dance, and so I took her away from him. My mother didn’t want me to get married, wanted me to wait. I was already feeding ten people in my family, but I wanted to get married, and so I did. 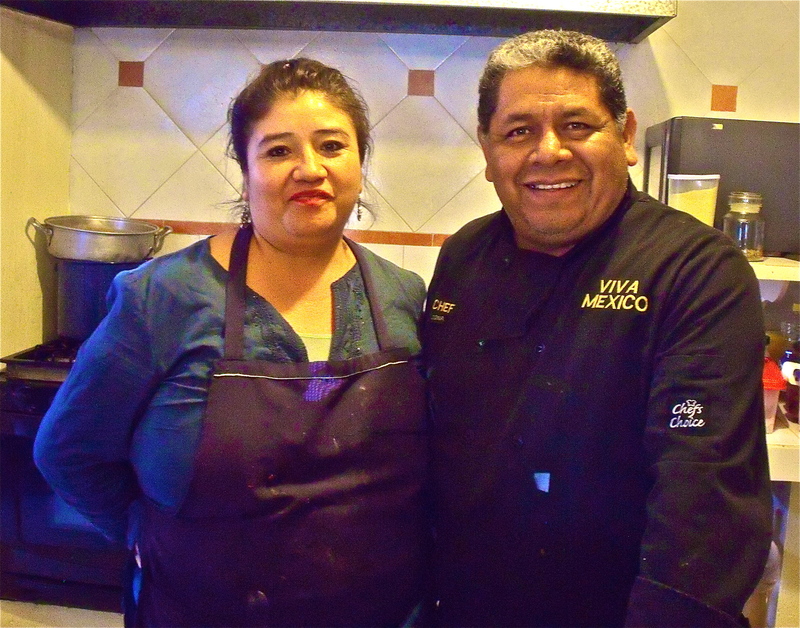 Twenty-two years later, Antonia and Agustin share cooking duties in their newly refurbished kitchen. 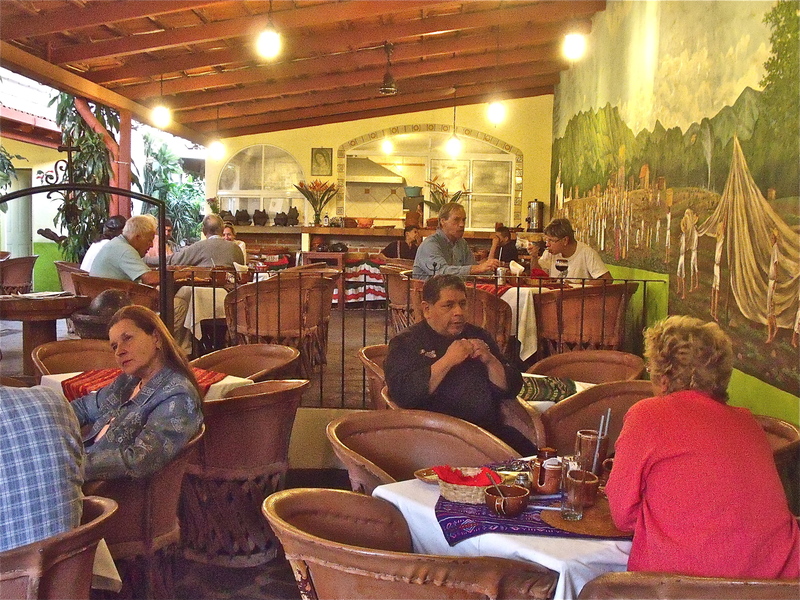 I was intrigued over how a young man with a wife and ten other dependents was ever able to become the self-educated, well-read community-minded restaurateur that Agustin is. 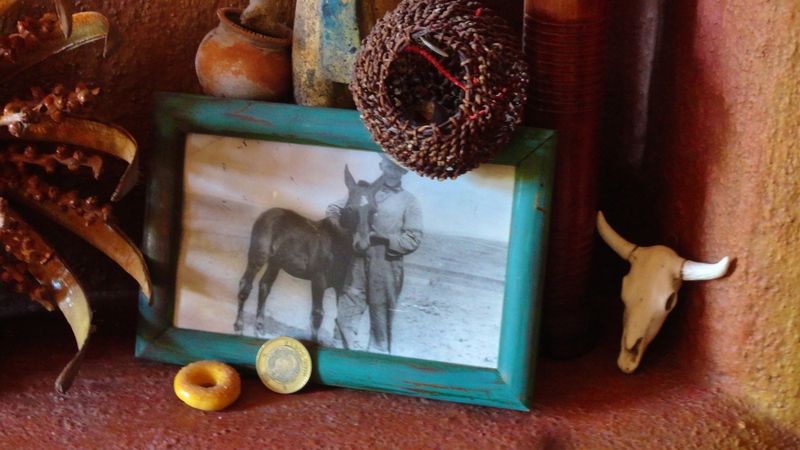 “How did you ever manage to get where you are today?” I asked, and Agustin, a natural-born storyteller, pulled up a chair to the table where I sat over my molcajete and resumed his tale. “During this time and afterwards, I taught English to 400 to 500 people from San Juan: gardeners, maids, taxi drivers, and students. This made me feel okay. I taught them for free or for one peso per class to buy diapers for my sons. Afterwards, I went to one or two schools to teach as well. 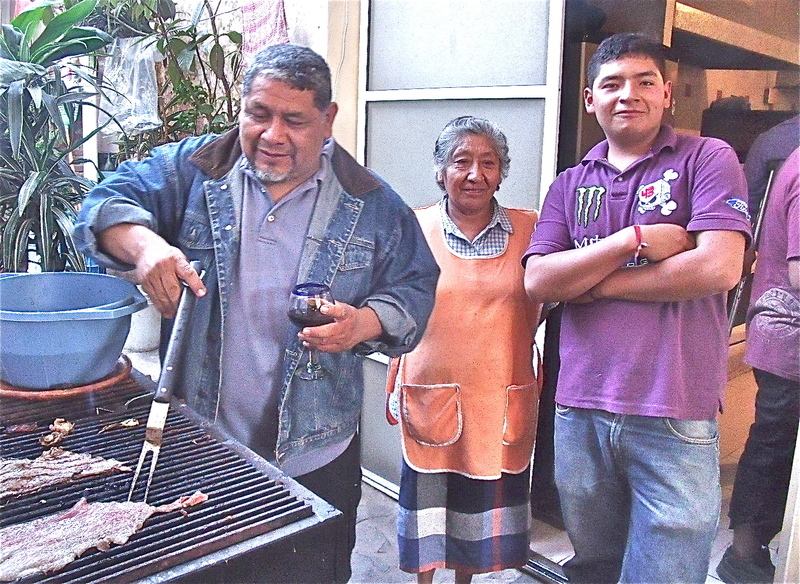 Three generations work together at Viva Mexico: Agustin, his Tia Lupita and his sons. In the years to come, Agustin expanded his already extensive resume. First he became a contractor. “The best guys in town work for me,” he told me. “Just 5 guys. I don’t need more. They have worked for me for 18 years, whenever I need them.” When I asked him how he obtained his contracting experience, he admitted that here, too, he was self-educated. “I knew it in my dreams how to do it,” he confided. I was reminded of my recent trip to see Frank Lloyd Wright’s home and studio near Scottsdale, Arizona, where I had discovered that the same was true of Wright, who never had any formal architectural training. Other years were spent as a real estate broker. When he first was hired to work at Laguna Real Estate, he had no car, so he bought one. It was very hard, he said, because most of the customers were American and Canadian, so they preferred to work with the American and Canadian agents. He took classes in English, which were hard—a different level of English than he had learned formerly. In the first week, he sold a house, but received no commission. 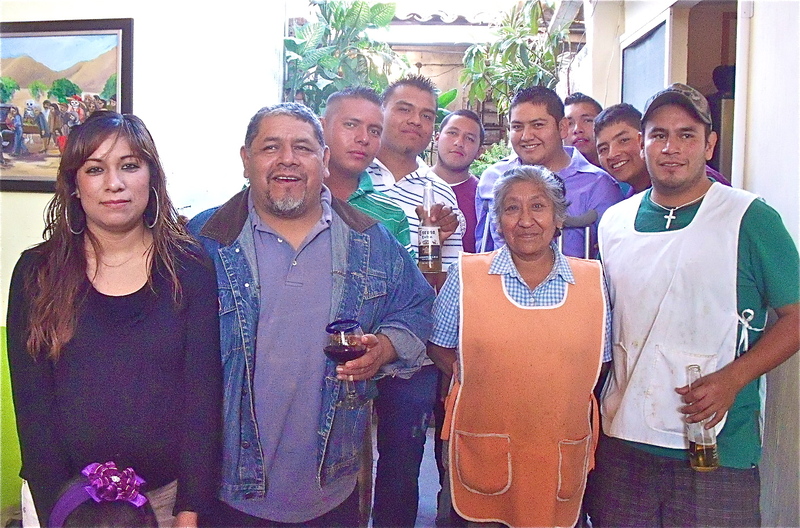 Agustin, his Tia Lupita and other members of his staff display their usual smiles. “What is left in life for you?” I ask him, and he answers, “Travel. If I had only myself to worry about, I would travel. People who travel live twice in their minds. Instead, I read, for people who read travel in their minds. Outside of his three trips to the U.S., what traveling he has done is in Mexico—every state except Chihuahua, Veracruz or Chiapas. When Ninos y Jovenes asked him to take over the purchasing of food and supplies for their residence school for disadvantaged children, his answer was yes, and he added this monthly task to his weekly trips to Guadalajara to buy food for Operation Feed. When Earl Smithburg, the former director of Operation Feed, died, Agustin provided the buses to transport people to his funeral. When I asked him to drive me into some of the areas worst hit by the tromba for a follow-up story two years later, the answer was yes. When I asked his construction company to repair my roof, the answer was yes, and I don’t believe I ever received a final bill. I’ve asked about this countless times, and he never quite remembers what the amount is that I owe him. He has amazing skills: carpenter, mason, real estate broker, resort manager, construction design, construction manager, restaurateur and chef. In addition to this, he is an outstanding family man, father, neighbor and friend. It came as no surprise to me at all that when I asked him if he’d ever had his IQ tested that he said yes. With prodding, I got him to confess that his IQ was 144—genius level. Agustin takes time out to talk with one of his regulars; and yes, they were talking about books. “An absolute perfect host. He greets each person in his restaurant. If he is cooking at the time, he will wait until you are eating or afterwards, and then come up to your table, stand and talk for awhile, or if it’s a slow night, pull up a chair and talk to you. Energetic, generous, personable, devoted father, teacher, philanthropist, self-taught pillar of his family and community, a man with a heart of gold who goes out of his way to help others, Agustin Vasquez Calvario is a living testament to the truth that one person can make a difference. Judy’s note: This article was written a few years ago for an online magazine that is no more. 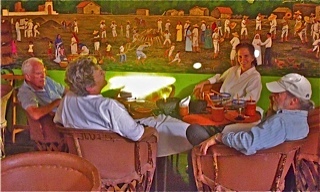 In the years since then, Agustin has created a huge gourmet kitchen and doubled the size of his restaurant. 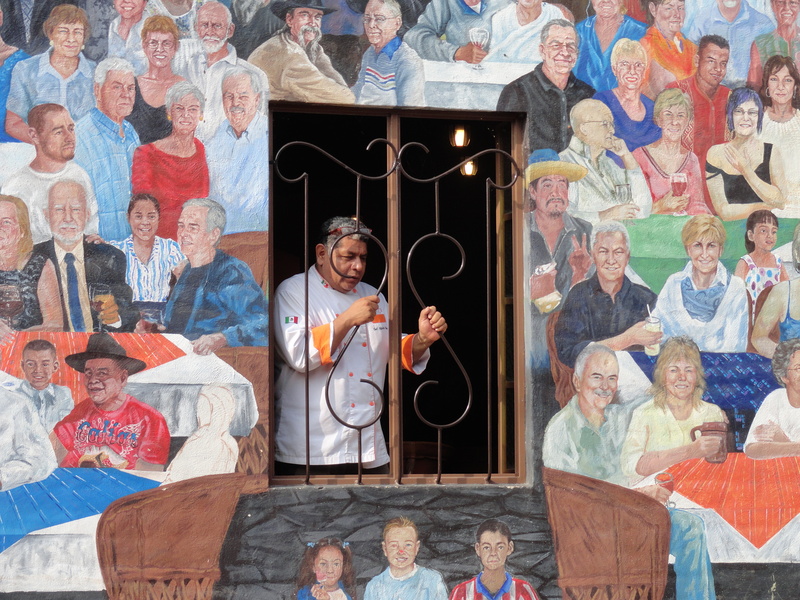 The same artist who painted the mural inside has covered the outside of the restaurant with a huge mural that depicts the inside of the restaurant with every table filled with Agustin’s regular customers depicted. I’m at a table in the front row with my best friends around me. Sadly, I am the only one who still lives in Mexico. Agustin has had many health challenges that have forced him to slow down and allow others to share some of the responsibilities he has always assumed. Although he has more helpers, new projects continue. He teaches English to Mexican adults and children, a children’s chorus now meets in the new half of his restaurant that only opens on weekends. A children’s orchestra has been started with instruments provided by solicitation of locals supportive of Agustin’s continuing schemes to give the youth of San Juan Cosala something to do more interesting than drugs and alcohol. 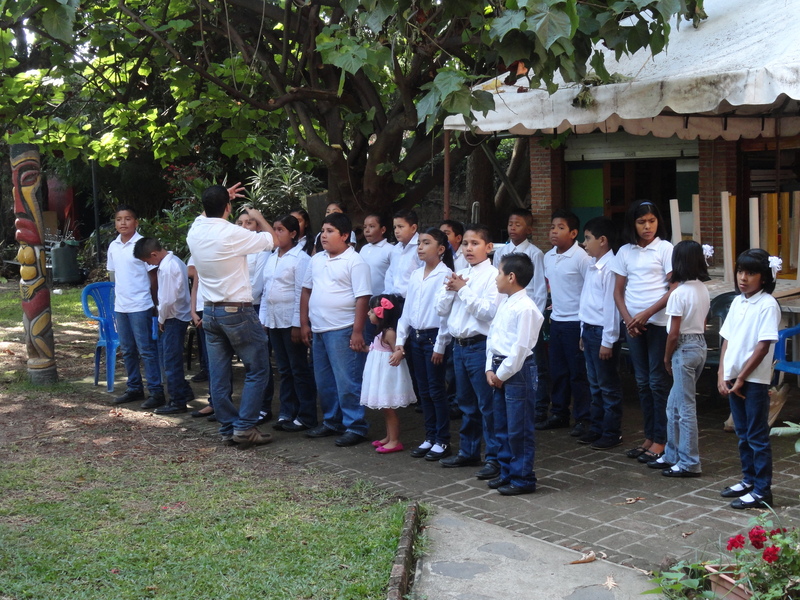 San Juan Cosala Children’s Choir. That’s Agustin’s granddaughter with the pink hair ribbon! Twice a year, clothes are handed out here to the pueblo’s poorest and every week, food is dispensed to the 100 poorest families. Meat, vegetables and fruit have been added to the rations which formerly included only dry foodstuffs and oil. 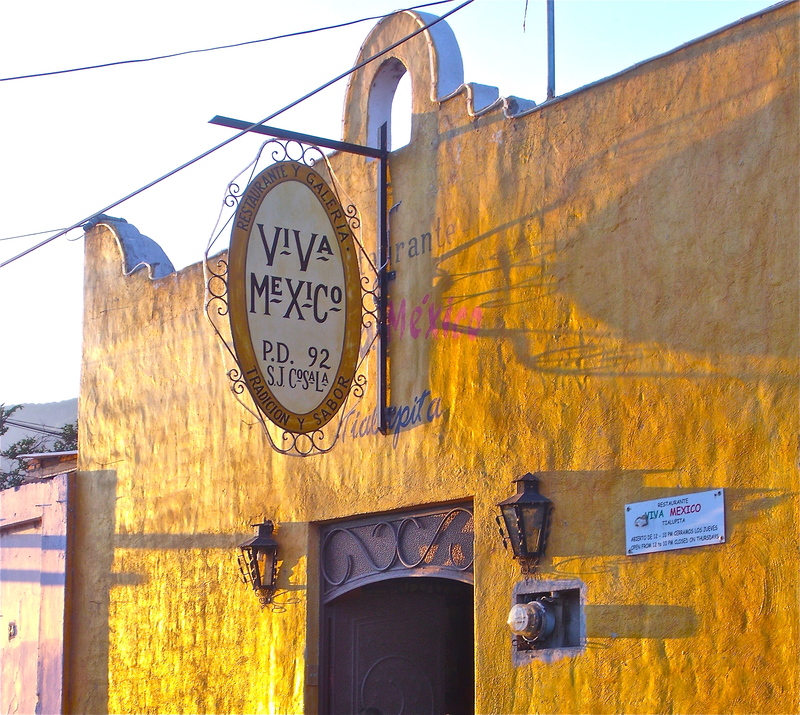 Things change and change as things do, but one thing that never changes is that Viva Mexico remains the heart of the community: both expat and Mexican. 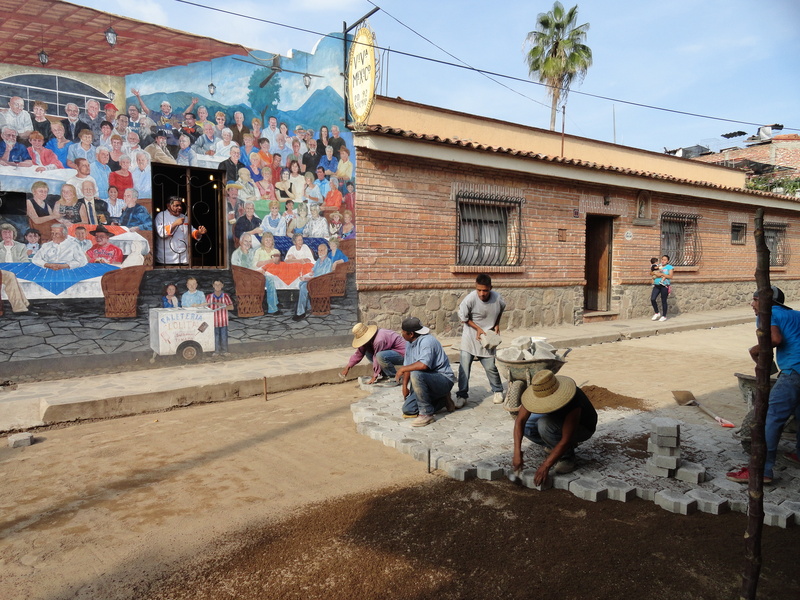 Changes continue as the real Agustin, customers and friends all seem to be supervising the installation of new pavers that replace the former cobblestones of the road leading from the plaza to Viva Mexico. UPDATE NOV. 29, 2016: We celebrated Agustin’s 50th birthday at Viva Mexico last night. See the story and photos in a new post HERE. 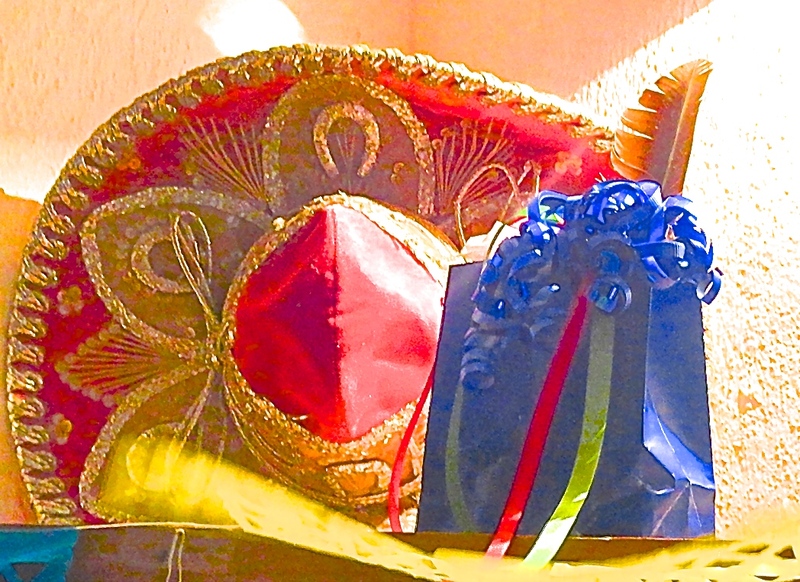 This entry was posted in Best Friends, Nostalgia, Wordpress Daily Prompt and tagged Agustin, Agustin Vasquez Calvario, Daily Life, Daily Post, Daily Prompt, Essays, Judy Dykstra-Brown, memories, Mexican Life, Mexico, People who make a difference, Restaurants, San Juan Cosala, The Daily Post on November 2, 2014 by lifelessons.